A young kangaroo emerges from her mother's pouch to learn how to hop. She watches as her mother and friends demonstrate by bouncing all over the place, but every time she tries she ends up flat on her tail. Finally, someone tells her to empty her pouch. The little kangaroo proceeds to pull out a treasure trove of kid goodies. No wonder she couldn't get off the ground! 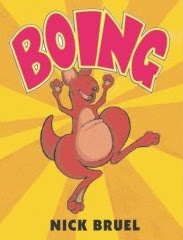 Once she is free from the weight of her childhood toys, she gives it one more shot and... BOING! This is a very cute book, but its message is a little outdated. Yes, it used to be true that you needed to shed your childhood baggage before you could make the leap into adulthood... but no more. 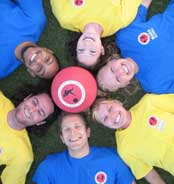 In today's consumer driven society, there is an entire market dedicated to accomodating the wants and needs of kidtastic adults. And that's just the tip of the iceberg. So, as you can see, there is no longer any need to empty your pouch of the trappings of childhood. By all means, take it all with you! From a sociological standpoint, this makes complete sense. We grew up as the first generation whose childhood was completely oversaturated by commercials. Previous generations were exposed to advertising, but nothing like the ruthless onslaught of brand name bullying that was Saturday Morning Cartoons. Madison Avenue unleashed an unholy army led by the Trix Rabbit, Zack the Lego Maniac, and the Mario Brothers, cold-blooded mercenaries who easily conquered us and turned us into the most maleable and market-friendly generation of all time. The message that they left us with was an almost zen-like mantra of Gimme Gimme Gimme. Apparently, the message was so powerful that, not only do we still want (need) to buy stuff, we still want to buy almost the exact same stuff that we did as when we were young. And true to their word, the market is providing us with tons of junk on which to spend our money. Hey, why should kids get to have all the fun? This redefinition of adulthood is a phenomenon that is described in excruciatingly pithy detail by the controversial new book, Welcome to Neverland: How the Free Market Raised Us To Be a Generation of Peter Pansies. Keep in mind, I am not disparaging anyone for "not growing up." As someone who spends his spare time writing about picture books, I'm the last one to pass judgement. As they say, people who live in glass houses should not throw stones. Well I'll be damned. So yeah, I guess they're right. 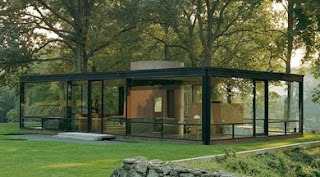 If you happen to be unlucky enough to live in this ridiculous glass house (in New Canaan, Connecticut of all places), it would not be a good idea to throw stones. Unless it's to throw them at the guy who had the brilliant idea to build your house with glass walls. In which case, throw away. I won't judge you. I'd have given this an LOL seal without much hesitation, except I just woke up from a nap so my laugh was more like a smirk. But then you jolted me into consciousness by tricking me with that link. You silly rabbit! Trix are for... adults with cavities? LOL seal approved.